Seven Heavens has suffered two frustrating defeats in a row and on Wednesday (10 April) Zac Purton will aim to end the exasperation with a maiden Hong Kong victory for the Frankel gelding in the Class 3 Dongcheng District Handicap (1200m) at Happy Valley. “The horse is probably racing the best he has, so that’s a bit of a bonus, but the draw (9) is a little bit tricky,” Purton said. Seven Heavens was snatched up on rifling late run last start when Utopia Life shifted out under a hard-riding Silvestre de Sousa and interfered with the Caspar Fownes-trained galloper. Seven Heavens finished strongly over the concluding stages once he found room and was promoted to third in the Stewards’ Room, while Utopia Life was relegated to fourth. Martin Harley was in the saddle that day but Purton has ridden the horse twice and admits that the five-year-old can be his own worst enemy at times. “He’s not a straightforward horse, he makes life hard for himself,” he said. Seven Heavens has placed three times this season by less than a length and the first of that trio came at Happy Valley (1200m) where he finished a neck runner-up. “He’s not an easy horse to work out at the moment, but he’s starting to show his best now and once they start hitting the line and finishing off their races it makes life easier,” Purton said. Seven Heavens has tested Fownes’ patience, remaining winless from 14 starts in Hong Kong. “I think he has preferred going down the straight at Sha Tin (1000m), but there’s no races on the programme, so we just have to go with where we can take him,” the trainer said. Purton leads the premiership with 98 wins and Fownes has entrusted the Champion Jockey with the task of finding the right route from the awkward gate (9). “I’ll leave it to Zac but I don’t want him hassled early, I want him to just relax and hit the line,” Fownes said. Seven Heavens was imported from Britain where he was trained by John Gosden and managed to register two wins from seven starts. California Argent went from being last on debut to clocking the fastest (22.0s) last 400m of the race in third at his most recent outing. On Wednesday he will look to score a breakthrough win in the Class 3 Hong Kong Exchanges Challenge Cup (1000m). “He was pretty impressive last time, he came down the outside to finish off really strongly,” jockey Karis Teetan said. The Tony Cruz-trained galloper was found to be lame after fading out on debut, however his relocation to Conghua has resulted in an upturn, and Teetan is expecting further improvement. “He’s already improved from that run and he appeared to handle the Valley pretty well, so you have to be confident,” the Mauritian said. Teetan will also partner the Frankie Lor-trained Joyful Heart in The Class 4 Beijing Clubhouse Anniversary Cup (1200m). “He won a very nice race when he was first up with me here at Sha Tin over 1000 metres, then the second time he was drawn on the inside and the winner (Voyage Warrior) was a bit too good for them,” Teetan said. Joyful Heart has raced twice at Sha Tin and will race at Happy Valley for the first time on Wednesday. Lor believes Joyful Heart will handle the tight-turning city course. “I think he’s a really smart horse, I think Happy Valley should not be a problem for him, he’s trialled there once before and he looked good,” the trainer said. Derek Leung is the only jockey to have won on Salto Olimpico and on Wednesday he will attempt to double his tally on the David Hall-trained entire in the Class 4 Dongzhimen Handicap (1800m). “He’s been a very honest horse in Class 4 and I think he went very good at his last two starts. 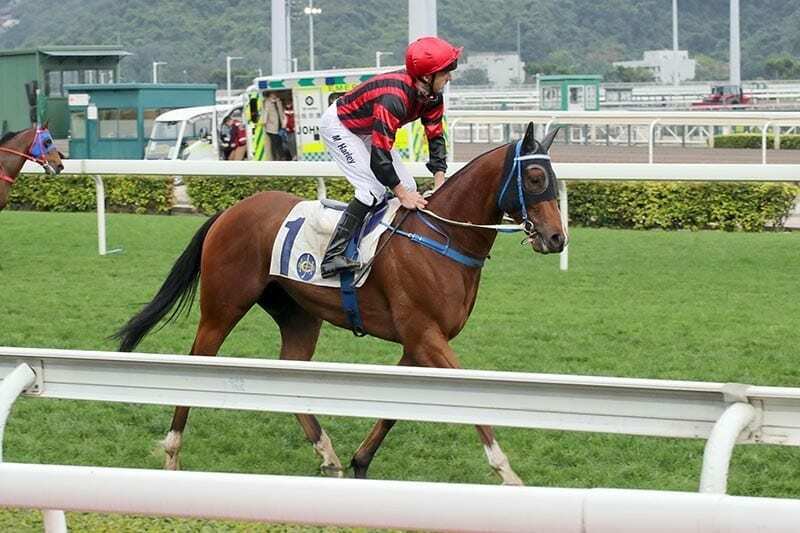 Before his last start someone took him on at the 1000-metre mark, but he still finished off and was only beaten by a small margin,” Leung said. Salto Olimpico led two starts ago at Happy Valley (1800m) only to be run down by a short head in the shadows of the post. Leung is pleased to see his mount stepping back up to 1800m after finishing unplaced over 1650m at his most recent outing. “Eighteen hundred (metres), two thousand, twenty-two hundred, he can still handle it,” he said.